Action Alert!! Whales and Dolphins Threatened by Seismic Testing! On August 29th, 2011 the National Oceanic Atmospheric Administration (NOAA) will decide if they want to grant the Scripts Institution of Oceanography and others, a Incidental Harassment Authorization to impact or take up to 19 ocean species of whales and dolphins. Only last year NOAA granted the Navy a Incidental Harassment Authorization to impact 2.2 million marine mammals in the Pacific Ocean with the expansion of their Northwest Training Complex. Despite the protest of people living on our coastlines, and around the world the permit was granted. From November to December of 2011 Scripts Institution of Oceanography and others plan to engage in seismic testing in the western tropical Pacific Ocean. For two months the cetaceans and all sea life for 100’s of miles will be exposed to this ear shattering sound. The seismic testing ships use air guns that are dropped into the water and towed while omitting continuous bursts of air that are bounced off of the sea floor. The magnitude of the sound created by the air guns can be lethal to cetaceans who already have to live with the sounds of man’s invasive activities in the ocean, “Shipping is the most omnipresent source of anthropogenic noise in the sea, though not nearly as loud as sonar or airguns; overall, shipping is blamed for a 10-20dB increase in the background noise in the sea throughout the world since 1950 (which translates to a 100x to 1000x increase in the intensity of background noise). Meanwhile, seismic surveys utilizing airguns create noise nearly as loud as the military sonars, but continuing every 10-15 seconds for days or weeks at a time”. (Acoustic Ecology Institute, Air guns, August 7, 2005). The Scripts Institute of Oceanography claim this survey is to determine the earths crust during the Jurassic period, approximately 145 to 180 million years ago. (http://www.nmfs.noaa.gov/pr/pdfs/fr/fr76-45518.pdf). By coincidence mapping for oil can be done in the same fashion although there are other options. Regardless of their intentions when will the impact of sound on cetaceans and all ocean life be weighed against what is to be gained. Should we destroy our future on this planet to learn about the past? Listen To The Power of the Seismic Survey! Their permit states this is a level B harassment, and that most likely, no whales or dolphins will be killed by their blasts of sound. NOAA is allowing the public to comment on the issue. NOAA’s permit process is very elusive making it almost impossible to make a comment. It seems they really don’t want to hear our voices but they must. We need to let NOAA know that this is unacceptable. The impact is too great to whales, dolphins and other marine life that depend on sound transmission in the ocean and their sonar to navigate and hunt for food. Noise reduction is essential if we are to save our oceans. DEPARTMENT OF COMMERCE National Oceanic and Atmospheric Administration Takes of Marine Mammals Incidental to Specified Activities; Low-Energy Marine Geophysical Survey in the Western Tropical Pacific Ocean, November to December, 2011 SUMMARY: NMFS has received an application from the Scripps Institution of Oceanography (SIO) for an Incidental Harassment Authorization (IHA) to take marine mammals, by harassment, incidental to conducting a low-energy marine geophysical (i.e., seismic) survey in the western tropical Pacific Ocean, November to December, 2011. Pursuant to the Marine Mammal Protection Act (MMPA), NMFS isrequesting comments on its proposal to issue an IHA to SIO to incidentally harass, by Level B harassment only, 19 species of marine mammals during the specified activity. Comments and information must be received no later than August 29, 2011. Here is a sample letter. You can just cut and paste it into an email. I am writing in regards to Scripts Institution of Oceanography’s request for an Incidental Harassment Authorization (IHA) to take marine mammals, by harassment, incidental to conducting a low-energy marine geophysical (seismic) survey in the western tropical Pacific Ocean, November thru December of 2011. Last year you gave the Navy a permit to harass or take 2.2 million marine mammals with the expansion of the Northwest Naval Training Complex. 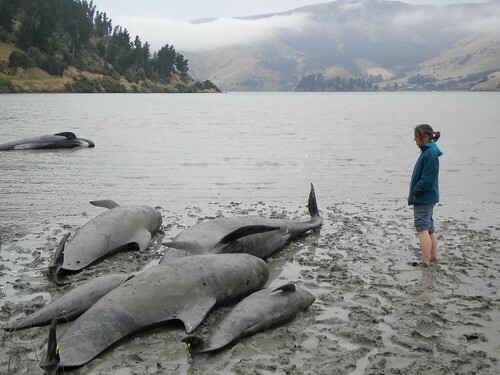 Since that permit was given for the five year period several fatal incidents have occurred as evidenced by the explosion of five dolphins, and multiple strandings along our coastlines along with many we are not even aware of. I urge you not to give the Scripts Institution of Oceanography this permit to do seismic testing. The cetaceans of the western tropical Pacific Ocean already have so many obstacles to their survival from the impacts of pollution, sonar, fishing nets, ship collisions, and noise produced by ships. Isn’t it time we started reducing sound pollution in our oceans not adding to it. The whales and dolphins are essential to our oceans health and safety. Is learning about the past worth destroying our future. Without our oceans this planet will die. Please take my comment seriously and do the right thing, do not give SIO the permit. This entry was posted in Baleen Whales (Mysticeti), Cetaceans, Dolphins, Porpoises, Whales by Kirsten Massebeau. Bookmark the permalink. Julie, we are very sorry, it is not the first time this has happened with that address. We have been in Portland all day finalizing details for our Sept. 1st event, Day of Awareness for the Dolphins of Taiji. We will get back to you as soon as this address us corrected.